We're on top of news around the web about digital a/v repositories, so you don't have to be! Adopters, stakeholders, devs and other blog readers! Hello from Avalon! But we're also very excited to bring a new weekly blog feature to all of you: the Friday Round Up. Inspired by ArtStor's blog, each Friday, we will bring you interesting news from around the time-based media world, things that should delight, excite or at least get you thinking about your own repositories and how best to build, display and preserve. We're happy to announce that we will begin Avalon Media System's Community Development Assessment of Scholarly Needs at Northwestern University Library. This study, funded by the Andrew W. Mellon Foundation Grant, will allow us to investigate how academics use media in their research. We are in the process of contacting professors at Northwestern, who will agree to two observations, three interviews, and a six-month diary study. We are looking forward to working with academics to learn more about how we can better develop Avalon for their needs. In addition, what we learn during this study will be helpful in adapting it for Indiana University Libraries. Avalon is supported by several platforms including: Windows 7-10; Mac OS X 10.8-10.10 (Lion, Mavericks, and Yosemite); iOs 5.1-89; and Android 4.1-5.0. On Android, Avalon supports the Chrome browser on devices running Jelly Bean 4.1 or higher. In regards to other browsers, Avalon is supported by: Chrome 47-48; Firefox 38-39; Safari 8-9; Microsoft Edge and Internet Explore 11; Chrome for Android 42-44; and Mobile Safari 9537.53-600.1.4. On these various platforms and browsers, one can not only view media but also edit it. For more details about our current release, please consult the Wiki. As we develop Avalon further, we aim to reframe accessibility in terms of what we can provide our users, rather than discussing what people lack. To that end, some of the features of the newest release of Avalon expand the usability of our software. The default language (English) is declared on each page. Search terms are included at the beginning of the page titles for search result pages. The URL provided to share (link to) specific content includes an appropriate title attribute. Additionally, R4 is more accessible for keyboard users. You can now use the TAB key to move forward through each interactive element on the page, such as links, text fields, search, and buttons. In order to move backwards through these elements, all you need to do is press SHIFT + TAB. Furthermore, in order to easily and clearly navigate the page, each element will be surrounded by an outline as one moves from element to element. If the user wants to engage one of the elements, they simply press ENTER when the element is highlighted. To make keyboard navigation even easier, the first element on each page is a “Skip to main content” link. This link moves the browser focus to the main content of the page. When viewing an audio or video page, the “Skip to main content” link moves focus directly to the Play button. The player we use for Avalon comes from MediaElement.js and as they have updated their player with more accessible features, we have come to benefit from these enhancements. Like general page navigation, using the TAB key allows users to move forward through each button on the player: Play/Pause, Mute Toggle, Stream Quality, Create Thumbnail, and Fullscreen. Like other page elements, a surrounding outline visibly distinguishes it from surrounding controls. In order to trigger one of the buttons, the user just needs to press ENTER. More details and examples of features from our current release can be found on our Wiki. On the roadmap for future releases is to provide Closed Captioning for our media player. With the assistance of Indiana University’s Assistive Technology and Accessibility Centers, we look forward to making accessibility integral to Avalon’s future development. Chris started working at Northwestern University Library in mid 2013 and began working on the Images/DIL project where he helped update the project, add in automated tests, and develop MENU. He previously worked as a consultant in the trading and financial industry, a startup, and a credit card processor. He's used many programming languages and frameworks and is really excited to contribute to an open source application that will be used in education. He'd be really excited to never do anything intense in PERL again. Evviva Weinraub is the Associate University Librarian for Digital Strategies at Northwestern University and the co-Project Director on the Avalon project. At Northwestern, Evviva has broad responsibilities for development and implementation of technology services within the libraries primarily focused on digital collections and repositories, metadata and discovery services, and infrastructure and desktop computing. With Avalon she works with her co-Director to establish overall project direction, management, and priority setting, as well as coordinate involvement with the project's partners and advisors. 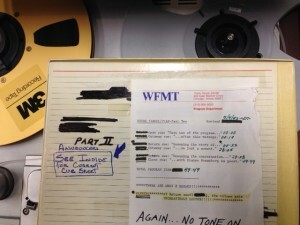 One of the publicly accessible collections Northwestern University has on its Repository site is The Robert Marcellus Master Class Audio Archives. The collection consists of 131 ¼” open reel audiotapes that have been digitized for preservation and access. These tapes document a series of Northwestern University master classes held by the American classical clarinetist Robert Marcellus from 1977 through 1990. Listening to the classes reacquainted me with the art of breathing that I had to learn when playing clarinet in middle school. Marcellus’s soothing voice leads his class through proper embouchure. It is only after 35 minutes into the first class (1977-06-28) that we actually hear a clarinet playing, and it is beguiling when we finally do (37:15). Harlow Hopkins, a professor at Olivet Nazarene College (now University) is “the first guinea pig,” as Marcellus introduces him. Though his performance of Cyrille Rose's “40 Studies, No. 13" sounds delightful to my slightly-better-than-totally-untrained ear, Marcellus’s incisive critique demonstrates his generosity. He encourages the clarinetists to think in eight notes, not simply quarters, in order to better understand the phrasing in the etudes. Listening to his comforting voice, I started miming old key positions. More than conjuring up personal memories of band camps, this collection has been exceedingly helpful for many professional clarinetists today. Greg MacAyeal, Acting Head of Northwestern’s Music Library, recently gave a talk entitled “Avalon and On! : The Robert Marcellus Master Class Audio Archive” at the Music Library Association, Midwest Chapter Annual Meeting (Lousiville, KY, October 16, 2015). While the collection received various requests in its analogue form, since being digitized and made available for public use through Avalon, there have been 5582 page hits since the site launched. While 80% of page hits originate from the US, with cities such as Houston, Evanston, Chicago, New York, Denton, and Indianapolis, MacAyeal told me that interestingly Paris, France ranked as the third city for most page hits. While it is still unclear the extent of Marcellus’s connections to France, in his first master class he discusses how his high school teacher, Earl Hamlin was a pupil of Georges Grisez, a famous French-school clarinetist. This school is the mode of instruction that Marcellus imparts in his Master Classes - practical exercises to focus on breathing and what he describes as the “neat clarity of finger action” — and apparently they are still relevant to assessors of the collection today in Paris and worldwide. MacAyeal remarked how this partnership between The Robert Marcellus Master Class Audio Archives and Avalon Media System has provided a significant contribution to the clarinet community. He has presented on the collection at the 2012 ClarinetFest and the Audio Archives were featured in the community newsletter, The Clarinet, in June 2014. Today, October 27, is the World Day for Audiovisual Heritage. This commemorative day was chosen by UNESCO (United Nations Educational, Scientific and Cultural Organization) in 2005 to raise public consciousness about the importance of preserving recorded sound and moving image media. Along with the Co-ordinating Council of Audiovisual Archives Associations (CCAAA) and other institutions, UNESCO has focused global attention on the fragility of this heritage. This year the theme is “Archives at Risk: Protecting the World’s Identities” and coincides with the National Film Preservation Foundation's Web Launch and the American Archive of Public Broadcasting Web Launch. On this day, take advantage of the audiovisual archives in your current communities, learn more about preservation events happening around the world, and enjoy newly preserved films. Avalon users can now use special URLs to jump to specified points within video or audio files. Users of Avalon 3.3 can take advantage of these new features by Upgrading Avalon 3.3 to Avalon 4.0. Please feel free to try out Avalon 4.0 on our public test server (http://pawpaw.dlib.indiana.edu) before installation. Many of our partners and potential partners who are interested in running Avalon need to start with a decision about their streaming server.We've heard from many of you that are currently a Wowza shop, and you report that it has worked really well for you, and are thus inclined to stay with Wowza. Now we can announce that during this last sprint, our developers have made Avalon compatible! For those of you who aren’t aware, Wowza Streaming EngineTM is high performance, extensible and fully interactive media streaming software platform that provides live and on-demand streaming, cha, and remote recording capabilities to a wide variety of media player technologies. The Wowsa Streaming Engine can deliver content to many popular media players such as Adobe Flash Player; Microsoft Silverlight player; Apple iPhone, iPad and iPod touch and Apple QuickTime player (version 10 or later); Android smartphones and tablets; and IPTV/OTT set-top boxes. Wowza Streaming Engine includes support for many streaming protocols including Adobe HTTP Dynamic Streaming (Adobe HDS), Apple HTTP Live Streaming (Apple HLS), Microsoft Smooth Streaming, MPEG_DASH streaming, MPEG-2 Transport Streams (MPEG-TS), Real Time Messaging Protocol (RTMP), Real Time Streaming Protocol (RTSP), and Real-time Transport Protocol (RTP). It’s an alternative to the Adobe Media Server, Darwin Streaming Server, Microsoft IIS Media Services and other media servers. Now, Avalon is connected to Wowza, creating an easy solution for many institutions that were already using Wowza for other media streaming projects. Of course this is blog worthy for a couple of reasons, one being we hope that this will open the door to many Wowza shops, but we also hope that our community is feeling heard as we prepare to release Avalon 4.0. Your feedback is crucial to making Avalon a success, and we welcome all questions and comments. The best place to reach out is avalon-discuss-l@list.indiana.edu. Release 4.0 is coming soon – look here for more updates.